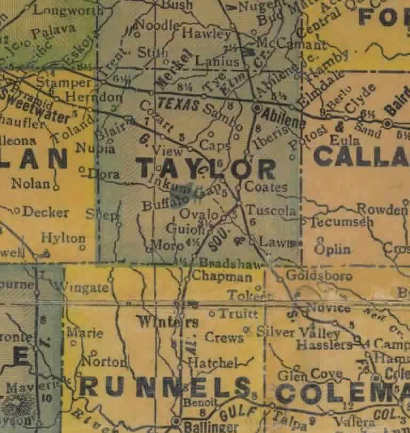 Taylor County Texas history, town lsit, vintage maps. Created 1858. 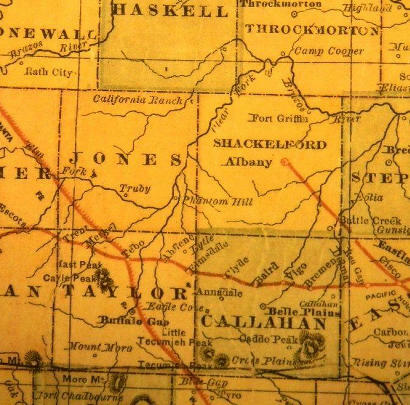 Named for Edward, James and George Taylor, 18, 20, and 22, Tennesseans who came to Texas in 1833 and died at the Alamo, March 6, 1836. 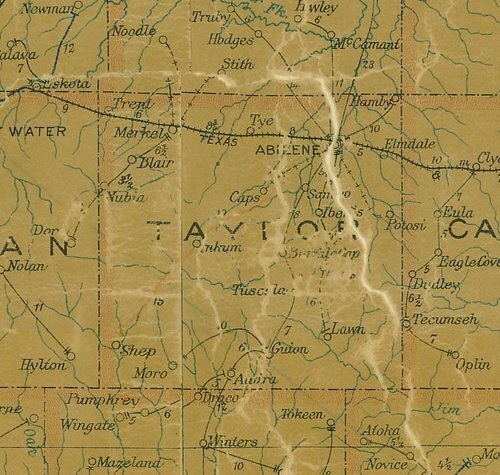 Organized 1878, with county seat at Buffalo Gap, through which went the Fort Concho to Fort Belknap stagecoach and longhorns on western trail up to Kansas. 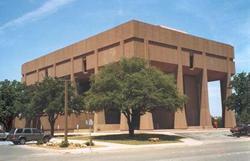 County seat was moved to Abilene in 1883. Of the 254 Texas counties, 42 bear Indian, French or Spanish names. 10 honor such colonizers as Stephen F. Austin, "Father of Texas". 12 were named for Washington, Clay and other American patriots. 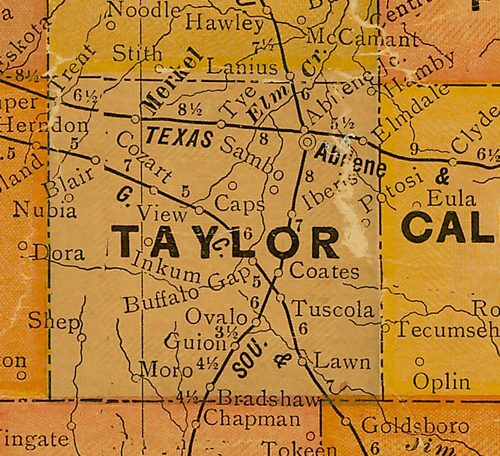 96 were named for men like the Taylors who fought in the Texas War for Independence (15 dying at the Alamo), signed the Declaration of Independence, or served as statesmen in the Republic of Texas. 23 have the names of frontiersmen and pioneers. 11 honor American statesmen who worked for the annexation of Texas; 10, leaders in Texas since statehood, including jurists, ministers, educators, historians, statesmen; and 36, men prominent in the Confederacy during the Civil War. El Paso and 8 others have geographical names, San Jacinto and Val Verde were named for battles; Live Oak and Orange, for trees; and Mason for a fort.